Today, we shed light on one of the Elasticsearch solutions – Elastic Layered Navigation for Magento 2 by Elastic Ecommerce. The Magento 2 module equips ecommerce site owners with a robust set of tools for improving navigation on the category and search results pages. The extension allows choosing multiple attributes in the layered navigation filters, enhances shopping experience with the AJAX Cart functionality, and leverages Infinite Scroll loading in the products listing. Below, we describe these and other features of the Elasticsearch Layered Navigation module in more detail. Elastic Layered Navigation for Magento 2 allows using layered navigation filters both on category and search results pages. With the module, online shoppers can apply various filters to the search results and narrow down products selection by such attributes like color, size, category, rating, or price. Besides, the Magento 2 layered navigation extension allows selecting multiple product values for the same filter, which drastically enhances navigation on a website. Due to the integration with the Elasticsearch server, web store visitors can enjoy instant loading of the products based on the applied attribute values. Magento admins get various options for configuration of the frontend appearance of the filter layers according to specific needs. The position of the product attributes menu in the filter is adjustable – admin users can select between the top, left, and right side of the page. Besides, it is possible to customize the look of filters with sliders, color swatches, and checkboxes. As for the price filter, you can display it as a slider or input boxes. Also, it is possible to show the number of results per each attribute. As for the products listing appearance, you can decide whether to show it in a grid or list and highlight keywords in the search results with customizable background and text colors. Besides, Elasticsearch Layered Navigation allows placing the “Add to Cart”, “Add to Wishlist”, and “Add to Compare” buttons, as well as displaying product reviews for each item in the products listing. 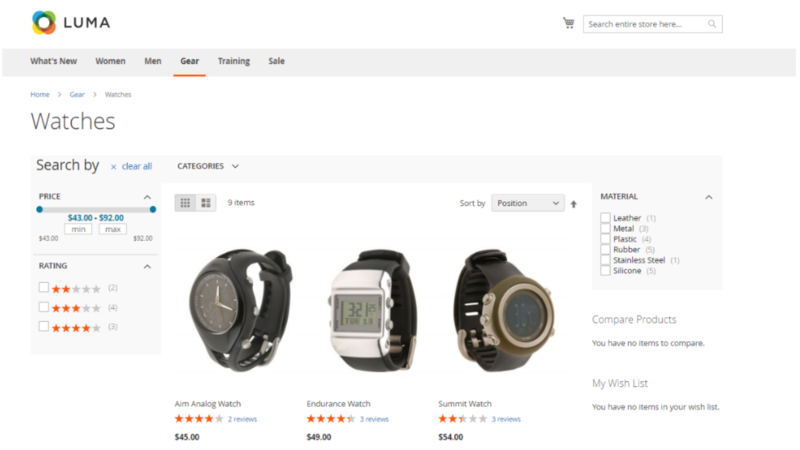 With Elastic Layered Navigation for Magento 2, you can use the sorting of products by relevance, product name, price, or rating. 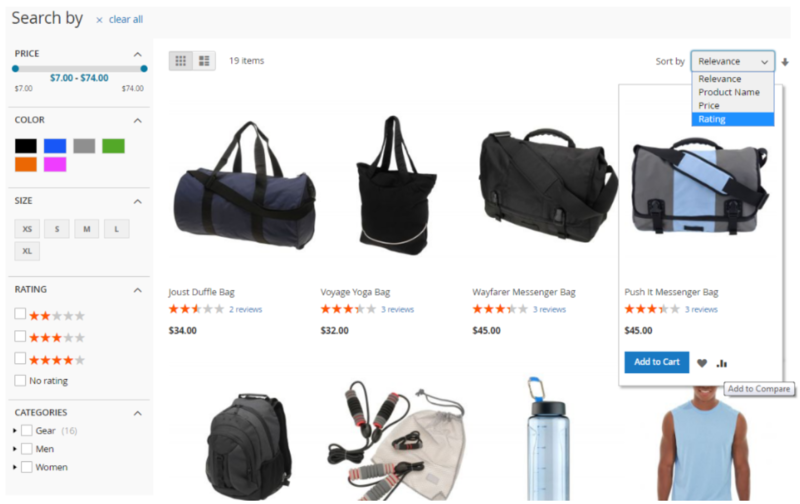 Filtering out products by rating helps website visitors quickly check the most popular products on your store. Another essential feature provided by the Magento 2 layered navigation module is Ajax Cart for category and search results pages. Thus, your customers get better user experience when shopping on your store since no page reloads occur on adding an item to the cart. Furthermore, Elasticsearch Layered Navigation allows enabling the Infinite Scroll function for the category and search results pages and configure its options. As for other settings of the Magento 2 layered navigation extension, it is possible to enable breadcrumbs, so that applied filter values will be displayed on a page. Admin users can also customize labels for the “Clear All”, “Sort By”, and “End of List” elements. Besides, when using the Infinite Scroll, you can set the limit on the number of products displayed in the listing. If Infinite Scroll is disabled, you can set the number of items for the current page. Elasticsearch Layered Navigation for Magento 2 by Elastic Ecommerce improves the default platform functionality and brings customers better shopping experience, enabling them to quickly filter out the products on an online shop and find exactly what they came for. 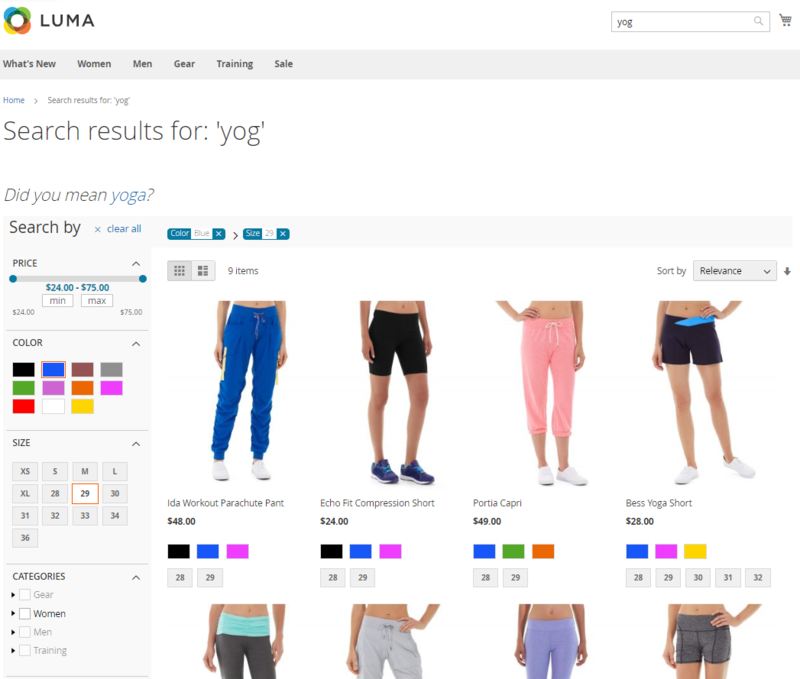 Elastic Ecommerce provides store owners with a highly customizable tool allowing to configure the product listing display according to the particular requirements.